I've been waiting for this awhile, not least because Ruins release their albums in Australia before the rest of the world! After impressing me with Cauldron and letting me down just a little with Front the Final Foes, I've been desperate for this band to come back and show me they still have it with a killer album, and after many listens I think - think - that Place of No Pity is that album. It's certainly the most modern yet in sound and style, swapping the cobwebs of old for a clean, glazed production, but also producing what may be the duo's best collection of songs yet. In terms of the band's general formula, Ruins are something like Celtic Frost/Triptykon meets latter-day Satyricon, mixing groove and atmosphere into a compelling whole. As mentioned, the technical skills are obvious - the members are Psycroptic/The Amenta's Dave Haley and Alex Pope, after all - yet the songwriting skills have been a little lacking on occasion in the past. Fortunately, this is different, as Inhabit the Twilight proves as it roars in, walls of guitars and intricit percussive batterings working their magic beneath Pope's bellowed vocals, the guitars broadening and taking on a greater atmospheric role as the track progresses. The technicality of the drumming has always distracted from the atmospheric effect of the black metal somewhat, but Ruins have set a good balance here, allowing their skills to shine without taking away from the darkness of the sound. Part of me can't help but think that this is how early Mayhem would have sounded if the members had been trained further in their instruments - not to detract from the compelling roughness of the classics, of course. But black metal has for so long traded on the feeling behind the music that the skill became an afterthought, and as good as the former is, there's no denying that the latter can be used effectively too in this sort of style. 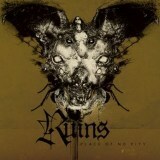 Ruins are not out to reinvent black metal, however, but to thrill the listener, and if the powerfully anthemic A Lesson in Ruthlessness doesn't have you headbanging like a lunatic then the fault is yours - it's precisely the sort of clarion call to darkness that recent Satyricon has been aiming for, albeit without the ensuing simplification of sound. Frequent tempo and riff changes serve to hold your attention, never devolving into mere repetition but using the crunching guitars' groove in a suitably ruthless way, not to mention the Frost-like battery - Black Crow On A Tombstone has nothing in comparison! Of course, howver, Ruins are not a Satyricon tribute in any way shape or form, as the ensuing epicness of Death Lends the Ultimate Touch shows in its eight-minute glory. Ruins avoid most of the pitfalls that lengthy songs can tip a band into, and even manage to bring in a second lengthy track with the nine-minute title track, which is careful not to neglect the headbanging side with some seriously catchy groove, but which also climbs new heights with practically Drudkh-like instrumental passages, allowing the melodic riffing to work its magic. Elsewhere, Winters Will's melancholic heaviness and Let Them Perish's doom riffs show that the band's atmospheric side is developing, that they are content to let the music speak for itself without overegging the vocals. At just under an hour, Place Of No Pity has much to say, but it doesn't outstay its welcome or lessen in quality towards the end, using some well-placed and genuinely shocking screams in Oath to full effect. Ruins, being a band neither from America nor Europe, are always going to struggle to gain widespread note from a metal media mainly obsessed with both, but there's no reason to go along with this when such examples of quality are to be found outside it. An excellent album, ultimately.